"What are these on the ground?" my son asked me. "These are firecrackers leftover." I told him. Can we call it leftover? Paper and powder. It's not the normal meaning . . . so I don't think it works well. "Left over" is usually not used - you had ten firecrackers and only used seven, so you have three left over - they are leftovers. Personally, I'd say 'remains' - It's an uncountable word which looks plural but can be used either way. They (the bits of paper) are the remains of firecrackers. They are firecracker remains. It (the litter) is the remains of firecrackers. It is firecracker remains. (Those are)(That is) what's left (of)(from) the firecrackers (after they explode). Those are the leftovers from the firecrackers. 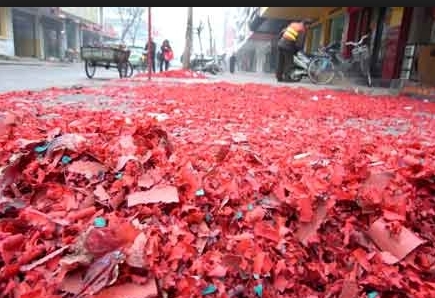 Those are the leftover firecrackers, which would, indeed, be unused firecrackers.